My left thumb is healing. Slowly. I pick at the cuticle. I pick compulsively at the cuticle even though I know I should stop. Any rough edges of the cuticle become fodder for a picking session. I will create a rough edge in order to have an excuse to pick at it. The slightly painful sensation is a pleasurable distraction from anxiety. I pick when I am sitting at my desk looking at my computer wondering which project to tackle or which decision to make – the one that makes someone happy or the one I believe to be the right one for the business. So, more to the point, I pick while postponing confronting a person or situation that makes my stomach lurch. I pick when I am driving. Yikes! Two hands on the wheel! I stopped when the kids were in the car, mainly because my son would point it out: “Mommy, stop picking!” I started wearing gloves when I drove. That was annoying. Now I place two hands on the wheel and breathe – commanding myself to focus on driving and not the incessant chatter in my head. It works for about a minute. And then I try again. I pick when I am sitting still, because I can’t sit still. My mind races through my to-do/to-worry list as my hands fidget and pick. I pick when I am standing in the kitchen, ostensibly preparing a meal, felled by some anxious thought until I shake myself back into the task at hand. When my cuticles are smooth, I will find a rough spot somewhere else on my skin to pick at. Usually around my right ear. My hair covers my ear so you can’t see the damage. It is better than it was. The cuticle of my right middle finger is also a target. At its worst, my left thumbnail was so damaged and ridged that it throbbed in the middle of the night and I was afraid it would get seriously infected. I wore band-aids. This was effective if I didn’t use my hands or wash my hands. The best bandage was Band-Aid Ultra-Strips. They stayed put – so well that it hurt to remove them from the nail. Keeping my cuticles and rough skin patches moisturized helps. The best moisturizer for this task is ChapStick, neither too light nor too greasy. I got manicures. The manicurist would tut-tut and scold me for picking and try to fill my left thumbnail with ridge-filler. Manicures helped for the first few days after I got my nails done and are a recurring tactic for weaning myself from this ocd, addictive, self-injurious behavior, which apparently has a name: Dermatillomania. I made this discovery after reading Alexandra Heather Foss’ post about Trichotillomania in the NYT superb anxiety blog. But manicures don’t fix the underlying cause of obsessive, ruminative, anxious thought and behavior patterns. Is it genetic? Definitely. I do not need any scientific proof to know this is true at the core of my being. My parents are anxious, risk-averse, cerebral introverts. 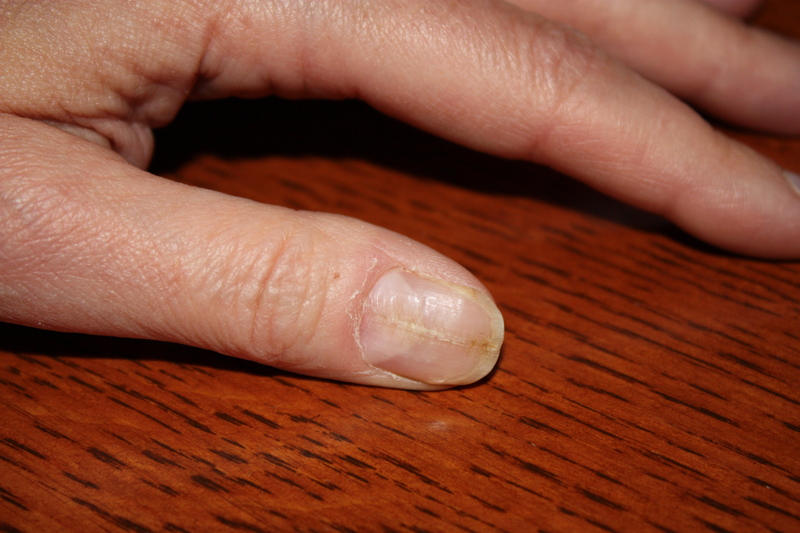 My mother rubs her cuticles and cuts them with cuticle nippers all the time, resulting in thick, ridged 90-year-old nails. My father, who is arguably borderline Asperger’s, has a ritual for many activities and a well-thought-out explanation for each routine. My son picks his nails and my daughter likes the sound and feeling of her hair ends pricking her skin. What have I done to my children! How can I help them?! The tendency toward anxiety is genetic and the response to the anxiety in the form of nail-picking is modeled in the family. Nail-picking must correlate with thumb-sucking. I was a thumb-sucker until age 11. My daughter was a thumb-sucker until the orthodontist forced her to quit cold turkey at 7. My son sucked a pacifier until he started biting them and they became a choke hazard. When I called to order a case of pacifiers, the telephone customer service rep asked me why I needed a case of them. I told her. She refused to sell them to me. Kudos to her. Cold turkey for him at age 2. One year, I created a chart and goals for us. After all, I optimistically announced, it only takes 21 days to change a behavior, to break a bad habit. We decided on what incentive we wanted when we achieved our goal of unpicked healthy nails: A Playstation for my son; a bed frame for my daughter; a Prada bag for me. They got their prizes. That was about 4 or 5 years ago. I am still waiting for my Prada bag. I don’t need the bag. I would be happy with unpicked healthy nails. I move inward, closing my eyes, paying attention to how my body feels. Usually, I tell my body what it should feel. With yoga, I listen to what my body tells me. I breathe. Slowly counting my breath gives my mind something to do besides dither, helping me to relax and to focus. Breathing and meditation have helped my perimenopausal insomnia, a profound relief. I listen to the teacher and her many directions. Concentrating on the poses and her voice gives my mind and my body something to do besides think and fidget. I learn that I am not my mind’s obsessive thoughts. I can observe my thoughts and begin to change them. I can observe my anxiety and choose a different, happier and more optimistic way of being. I become aware of habitual ways that I hold my body. I question why my right shoulder rolls forward chronically to protect my right breast and the tense pain in my neck that results. I stand straighter, more sure of who I am and that I am all right. I realize that I am not what I wear. I stop shopping compulsively. I savor the taste of food and eat mindfully. I eat less and enjoy food more. I learn that every step in the process is crucial and can’t be skipped. I slow down and stop grasping at achievement. The pose never ends. I make an intention on the mat to be more loving, honest and authentic off the mat. I do it. I never considered nail/cuticle biting and thumb sucking being related. I could definitely see it being true, though. I started picking the cuticles on my thumbs at a very young age. I tried many times to stop this addition, but after 3 decades of picking I found that I was now doing it subconsciously without even knowing it. I would look at my cuticles and wonder when I had picked them. It made me feel good, comforted in stressful situations, and I felt like me. Yet, they looked ugly, disgusting and often times caused others to fear of contracting a disease or fungus that they thought I had. My mother took me to the doctor when I was 12 years old because she thought it was nail fungus. I wondered too myself because I couldn’t understand why picking skin would cause my nails to grow this way. The doctor confirmed that it was I that was causing this deformation. I felt ashamed, and to comfort me from that shame I continued to pick at my cuticles. My thumbnails looked exactly like yours. With a dark jagged ridge down the center, the skin dry and peeling. Oh, how I got excited when I found a piece of dry skin ready for peeling. It would prevent me from doing whatever task it was just so I can pick, peel and bite. I would stop when it bled, but only in that spot. I would move onto a fresher area and continue. It sounds twisted, I know, but I loved it. To hide them from the world I would bend my thumbs into my fists or turn my hand in awkward positions when I came in contact with other people. A number of times I would file the nails down and paint them. If I filed too much the nails would be too thin and become tender with pressure put upon them, so I would often give them additional coats of nail polish to strengthen them again. Covering them up with band-aids would only prompt people to ask questions. Most of the time, I just let them be free. After all the looks, comments and shame I endured my entire life from this addiction, it took this article to finally get me to stop picking. I looked up my condition online and found that I was not alone. When I saw your photo I instantly saw myself. That was my thumb and I knew for the first time in my life that I was not alone in my addiction to cuticle picking. In that moment I made a promise out loud to my best friend, but mostly to myself to stop. It was very difficult, but with the aid of bandages, lip balm and lots of patience, I was able to finally overcome this addition. I had to prove something to myself. There are a lot of things that I have given up in my life that was hurting me and this one was by far the hardest to let go of. I know I can one day fall back into this addiction again, but I will look to other healthier options for my coddling and stress relief. I will be an addict for the rest of my life, but I feel like this is one giant leap for me. I have never gotten this far without picking before. I could never make it more than two weeks. But today is different. Today, after months of self-restraint, I am clipping the tips of my thumbnails and clipping off the last of my rigid nail. They are now perfectly smooth and normal looking. There is no trace of nail or skin damage and I feel like new person. I finally felt like me. Not the weaker, controlled-by-addiction me, but the real me. Thank you for your courage in writing this article. You inspired me to not only beat this addiction, but to realize the strength I have in myself to take charge of my life and to know that I can overcome much more. As difficult as beating this addiction was, I see now that this was just the fist step in changing my life. Wow, Alicia, thank you so much for sharing your story. I am thrilled that I had a part in your recovery. When I received your comment yesterday, I was – coincidentally – at the nail salon getting a manicure. I am picking less and that black line of damage on my left thumb is about 2/3 grown out. I had hoped, at the time I wrote this post, that I would be able to post a follow-up picture within a year of my healed nail. It is now nearly 4 years later and I am still struggling, but much better. This is me exactly!! My left thumb nail looks the same as in the picture above, only worse. I have been embarrassed of it my entire life, but I can’t stop picking… I want to have normal, clean nails so bad. Could you give me some tips on how you achieved that?? Hi, apologies for the delayed response. I think reducing anxiety is the most important thing you can do to reduce picking. I have tried a lot of ways to reduce anxiety. Here is my list of the most effective. I think you need to find what works for you. Keep nails manicured and moisturized. I have picked at the skin around my nails for my entire life… Until they bleed and are throbbing. I think it started out as an anxiety thing but now I just do it out of habit? Although I am very much an anxious person.. I am always worried about something and I can’t just have my hands doing nothing. Is that actually a picture of your hand?? Because my left thumb nail looks exactly like that! The ridges are bigger and the skin around my nail is really puffy because of how much I pick at it. I have never seen anyone else have nails like that besides me. It’s very reassuring. I have always been really embarrassed by it. It used to be on my right as well, but I made it a goal one summer to stop picking at the skin around that nail and the nail grew out and the ridges went away. Now my left is still really bad and I cannot get myself to stop that. I pick at the skin around my middle fingers a lot as well. I used to pick at my scalp all of the time too but I stopped that habit for the most part (thank god). I would stand in front of my mirror and scratch and pick at my scalp until it was bleeding all over…. Another thing I used to be extremely embarrassed about. I am 21 now and have been having issues with this I think since I was about 8 when I transferred schools and did not really have many friends. I stopped scratching my scalp when I was maybe 16 years old and catch myself doing it every once and a while, but I have a hold on it now. My life is better now, but my stress levels are at an all time high since I started nursing school this semester and my picking (mostly the skin around my nails) is getting back to what is used to be. Any advice that you found helped besides yoga?? Any tricks that helped you stop? Thank you for making this post! !